Westchester County’s proposed 2019 capital budget contains a major airport infrastructure project to repave runway 16/34 that would preserve & renew current levels of capacity at the airport for 20 years. This project is based on a study from the DY/Astorino master plan that ignored the environment and was disavowed by the current administration. We thus find it baffling that the county would plow ahead with this project before the development of a new master plan with real community input or a comprehensive policy to reduce the airport’s environmental impact. 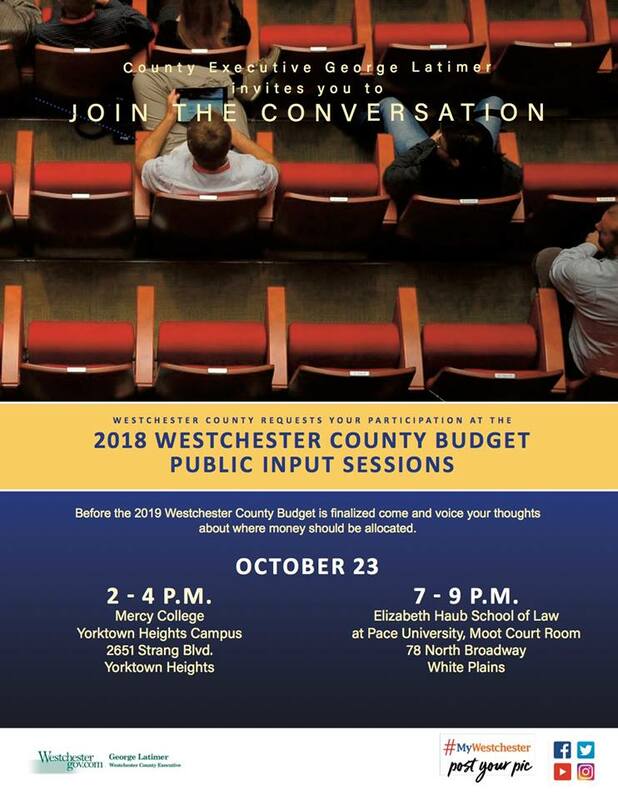 The county is hosting two public input sessions on October 23 to comment on the proposed budget. Please join us in speaking out against this thoughtless preservation of the unacceptable status quo. The county should halt airport capital spending until it develops a new master plan and a comprehensive airport policy that respects the rights of residents, public input, and the environment. Airport capital projects have far reaching impacts and they cannot be pursued simply because of inertia. Every decision at the airport, especially ones that last for decades, must be made thoughtfully only after careful consideration of how it fits into broader airport policy and its impact on aircraft operations and the environment. The proposed 2019 capital budget allocates $24 million to repave runway 16/34. This is the primary runway at the airport. It has the greatest impact on the size and rate of aircraft using the airport and their associated air, water, and noise pollution. The county is forbidden by federal law from regulating the size, volume, noise, or timing of aircraft using the airport. Therefore, capital projects like this one which affect the capacity of the airport to handle air traffic are the county’s primary tool to influence aircraft operations. This project is not getting the careful consideration needed in light of that fact. The environmental impact of the airport is already too great. Growth in the quantity and size of air traffic has created unbearable conditions for people living, working, playing, dining, or going to school under airport flight paths. Hundreds of residents spoke at four public hearings to oppose airport expansion, whether through continued increases in flights allowed by existing capacity or through further increases in capacity. Commissioner of Public Works & Transportation Hugh Greechan has claimed at Airport Advisory Board meetings that this project should continue because it is needed for safety and because it was proposed in 2014. With regards to safety, we do not believe his claims are justified. The FAA rates runway 16/34 as in “good” condition, second highest on their scale from “poor” to “excellent.” The “good” rating is typical of major airports with high levels of traffic. All of LaGuardia’s and JFK’s runways are rated “good.” It seems highly unlikely that delaying this project until the completion of a new master plan so that the public can weigh in will pose a significant safety risk. This argument may be based on a December 15, 2013 study conducted for the DY/Astorino master plan. That study predicted that runway 16/34 would be in “fair” condition by 2018. As the FAA continues to rate the runway as “good,” it would seem that this five year old forecast was inaccurate and should not be used as a rationale to move forwards with this project. Mr. Greechan’s second argument, that the project should continue because it has been planned for four years, is a ridiculous denial of the very reason he holds his job. Residents were fed up with Rob Astorino’s expansion of airport capacity & traffic and voted him out of office. Mr. Greechan’s apparent desire to ignore public input to plow ahead with Astorino’s plans defies belief. Runway 16/34 has greater capacity than the runways of every nearby airport, except for LaGuardia, JFK, and Newark. It is also in equal or better condition than the runways of every nearby airport. Teterboro Airport, Westchester’s main competitor for private jet access to New York City, has strict noise limits and a 100,000 pound aircraft weight limit. Westchester has neither, which is why private jet terminal Million Air advertises “No Weight Restrictions!” to aircraft considering Teterboro. Republic, Danbury, Waterbury-Oxford, and Bridgeport airports all also have less runway capacity. It should be no surprise, then, that the largest, noisiest, and most polluting aircraft are being attracted to Westchester. The airport operates well below its maximum capacity today. The only restriction on the rate and size of air traffic are the physical characteristics of runway 16/34. Airports with similar sized runways, like LaGuardia, can schedule flights every 90 seconds per runway. HPN regularly achieves this rate of operations during busy periods. This is especially galling on weekends & holidays, when residents’ quality of life is destroyed on the very days they most deserve the quiet enjoyment of their homes with friends & family. A blind renewal of existing capacity, especially in the absence of policies to rein in bad actors like Million Air, would keep us on a path to becoming LaGuardia North. The DY/Astorino master plan ignored public input and the environment. It used an unconstrained forecast of growth in aircraft operations to justify its calls to expand airport capacity. By contrast, County Executive George Latimer promised a new master plan with real public input. The county’s master plan should first determine the type, quantity, and rate of aircraft operations desired by the public, and then shape the airport’s facilities to precisely accommodate only that level of traffic. Repaving runway 16/34 before the completion of a new master plan defies Mr. Latimer’s calls for transparency, openness, and public input. Doing so would lock in current levels of airport capacity for at least 20 years. The newly repaved runway would be expected to last at least that long, plus the county’s acceptance of FAA grants to perform the repaving would require it to comply with FAA grant assurances for 20 years. The public has already spoken. Widespread opposition to current levels of airport pollution was already voiced by hundreds of residents over the last four public hearings on July 27, 2017, June 6, 2018, June 11, 2018, and June 25, 2018. Cementing the status quo with this project would be a travesty showing that the county will not change course in response to public input. We know that Mr. Latimer has better intentions and we call on him to prevent this from happening. Sometimes it is very difficult to get an infrastructure repair/improvement item such as this into a working/approved budget. Pushing necessary work off to a future budget may prove to be not an effective use of everyone’s time and energy. If this work is going to be done sooner or later, then I have always believed that sooner is better than later. Improving runway structure and integrity does not imply that restrictions already in place or soon to be in place will be violated. It is my hope that whatever the ultimately approved and executed master plan, it will reflect the social needs of county residents, most especially those who live in the areas either directly abutting or surrounding this jewel of an airport. Of the totality of all politicians, some have my trust, while others do not. In the end, we as citizens, could do much worse than George Latimer. While it is both OK and necessary to be pro-active and verify that trust, it is less than OK to use a 20-lb sledgehammer to do so. I have no doubt that Mr. Latimer has good intentions. The problem is that this project is being advanced with little or no thought as to its consequences. As I detailed in my post, the only reasons given are safety, which seems dubious, and because the Astorino administration proposed the project 4 years ago, which is ridiculous. It is worth noting that safety is frequently used to justify capacity expansion. However, this is a false argument. A two-lane country road would certainly be safer if it were developed into an eight-lane interstate. But this would undoubtedly increase traffic and cause significant environmental damage. There would be no argument that such a proposal would have to be evaluated carefully beyond purported safety improvements. The same must be true of airport infrastructure. The issue here is that Mr. Latimer’s staff have not satisfied their burden of proof that this project is necessary now. They should first complete a new master plan with public input and develop a comprehensive policy to address airport pollution. To plow ahead without respecting the public makes a mockery of Mr. Latimer’s efforts to bring openness and transparency to county government. I am writing to the county executive and my legislator, Ms. Cunzio . Latimer should NOT include this project in his proposed budget going to the legislators in November, and if it is included, the legislators should NOT approve it. I encourage everyone to write to their legislators to vote NO on this capital project. I’m a little confused as to how repaving the existing runway is an expansion. All you have to do is look at the runway on Google Maps to see that the runway is deteriorating with cracks. In addition, the FAA frequently updates runway safety standards; a new runway will ensure that HPN is in compliance with all the latest safety standards. Not to mention the airport MAKES money – how about we use that money to improve the airport. Keyword improve – not expand – let’s make the experience better for everyone. I’d love to hear your thoughts on a terminal expansion. As a life-long Westchester resident, I can say unequivocally: the terminal is cramped. Often times, I can’t get seating in the gate area because it’s packed, security lines are long, and the ticket counter area is congested. The artificial capacity constraints that the county has on HPN means there is a clear cap in passengers that is not to be exceeded. Why can’t we expand the terminal so there are sufficient seats, charging ports, bathrooms, concessions, and queuing areas? We can maintain the same number of passengers, the same number of flights, no increase in noise coming from COMMERCIAL traffic, and improve the Terminal experience. Let’s get a Starbucks and a few more stores behind security so I have something to do while I wait for my plane. Let’s jet-bridge all gates so we don’t have to walk outside in the snow and rain. Let’s build larger bathrooms so I’m not two inches away from the guy next to me peeing. Let’s expand the security area so I’m not waiting in line for 25 minutes. Let’s build out the gate area with more seats (and while we’re at it let’s put charging stations under every seat) so I’m not stuck standing for an hour before my flight. What is your argument against expanding the terminal building? Is a larger terminal noisier? Maybe during construction, but once complete, a new terminal can be more environmentally friendly (LEED Certification), it would improve our travel experience, while not affecting noise WHATSOEVER. Look at Long Beach Airport in California for a great example of how the community and airport can come together to improve the flying experience while maintaining the integrity of the surrounding communities.